When NYX finally came to the UK, I was so excited to give some bits and bobs a try. They currently have a stand in Manchester, so I took a visit and picked up 4 things to try out! Liquid Suede Cream Lipstick I'm obsessed with finding liquid lipsticks in the UK (is it me or is every liquid lipstick only available in the US?? ), so I got the NYX Liquid Suede in Soft Spoken. I've found that this is a bit more of a cream lipstick as it doesn't dry completely matte, but it feels very moisturising and I love the colour (see swatches below). It's definitely a popular shade as it's a classic mauve brown tone and I think it's just gorgeous. Crystal Glitter Liner After seeing so many glitter tutorials in December, I just had to try out the glitter liners. I saw this colour on one of Desi Perkins' tutorials (this one) and so tried out using the liner as a glitter all over the lid to give a slightly wet look. 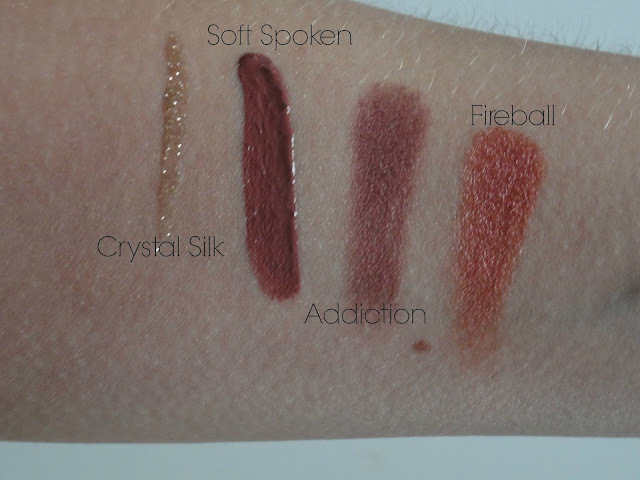 Hot Singles Eyeshadow in 'Addiction' I swatched pretty much every single eyeshadow they had in this range and Addiction was one of the only super pigmented ones. It's a pearly burgundy colour that I thought would look great in a cranberry eye look. I'm yet to use this, but I'm excited to give it a go and see how it looks on the eye! Prismatic Eyeshadow in 'Fireball' I've heard quite a lot about the Prismatic range and for good reason - this range is much more pigmented than the other eyeshadows and has some stunning colours! I wanted a green colour but it had sold out so I just got 'Fireball'. It's a gorgeous coppery red colour that has amazing pigmentation and shine to it. Again, I've not given this a go yet, but if you have any tips on what colours to wear it with let me know! Where do I get it? You can find NYX now online at Feel Unique, Boots and the NYX UK site. What do you think? Let me know if you've tried any of these products in the comments and what you love from NYX! I'm eager to try the Contour Kit next.